Visit our blog Achtung An­leihe! and stay up to date on all is­sues re­lated to bonds. Sign up to our free news­let­ter and re­ceive cur­rent in­form­a­tion right in your in-​box. Our news­let­ter is free, without any ob­lig­a­tion and can be can­celled any­time. “Achtung Anleihe! 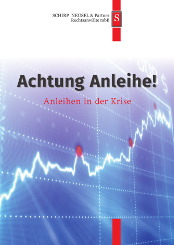 Anleihen in der Krise”, our current brochure on bonds, published by Schirp Neusel & Partner Rechtsanwälte mbB.